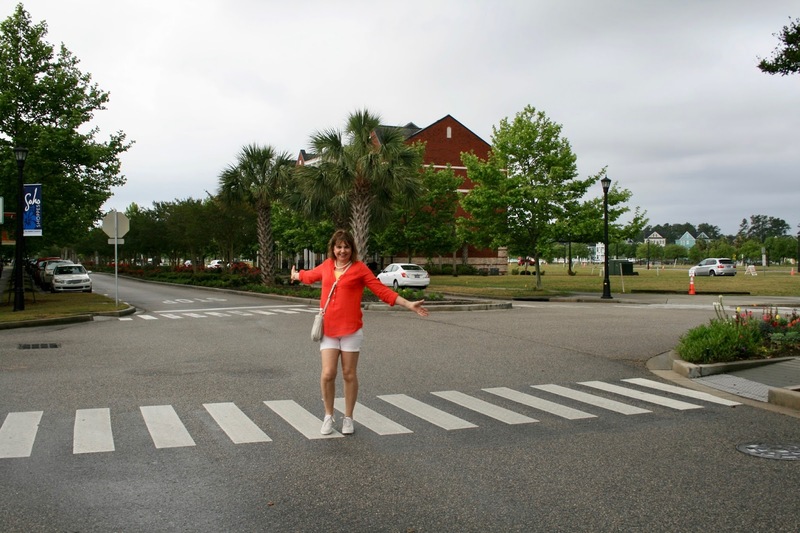 This is a continuation of a Travel Series of my vacation to Myrtle Beach. To start at the beginning go HERE. Our second day of vacation was a off and on rainy day. It rained early in the morning, then it cleared up, then it rained again most of the afternoon. Due to the rain, we decided to go shopping thinking we could duck in and out of stores in between rain showers. 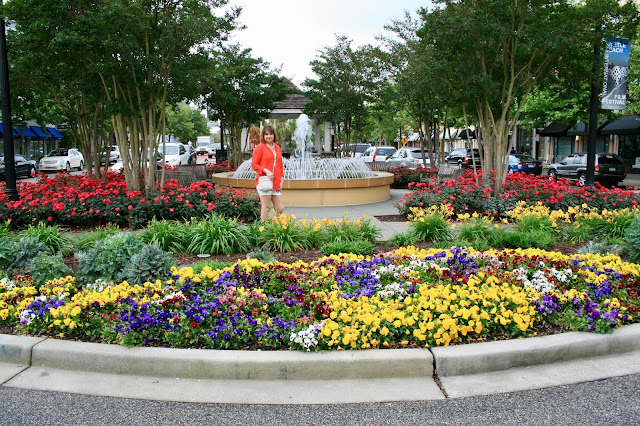 I had seen pictures of The Market Common prior to our trip and it looked so pretty I wanted to check out. What better thing is there to do on a rainy day? We lucked out on the rain as it cleared up and we were able to enjoy our time at The Market Common rain free until after lunch. I was so grateful as it was such a beautiful place filled with gorgeous flower gardens to explore. 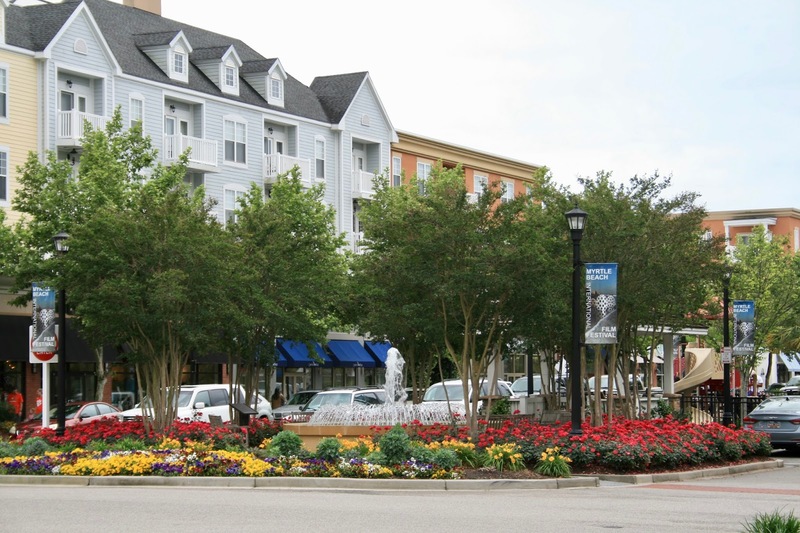 The Market Common is a upscale village with retail shopping, dining, a movie theatre, a large public square and lake, and also residences. My absolutely favorite part of The Market Common weren't the stores but the flower gardens. Wow! I felt at times as if I were in a botanical garden and not a shopping district. This village puts together some amazing flower displays. There were so many water features. 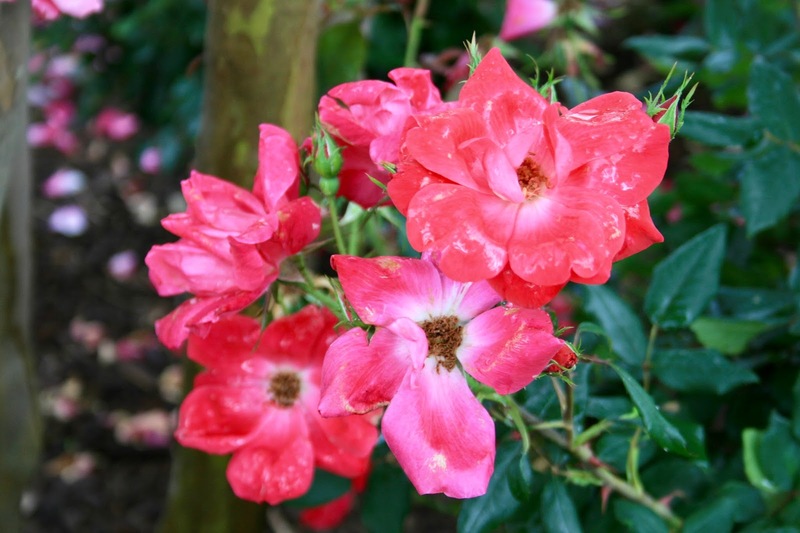 And aren't these roses gorgeous? We don't see roses in my neck of the woods until June or July, so this was quite a treat. There were so many benches and old wooden rocking chairs in the streets of The Market Common. They provided plenty of opportunity to sit and enjoy the beauty surrounding you. I grabbed a latte at Starbucks, and just sat and enjoyed my brew in a rocking chair. It was so relaxing. Many of the streets of The Market Common are paved in bricks and lined with palm trees and large Terra cotta pots. Above all the stores are apartments for rent. How cool is that? 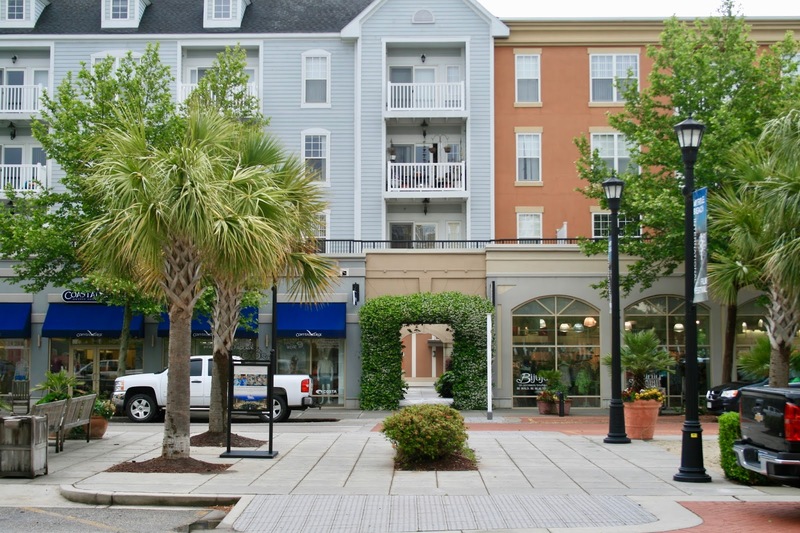 You could shop, eat, see a movie within a few feet from your home? I loved the design of The Market Common. The building styles and colors are so pretty. The stores are a nice mix of both high and low end, so people of all income levels will find something for them. But as I said earlier, my favorite part of The Market Commons was the gardens. They were so pretty, and manicured to perfection! 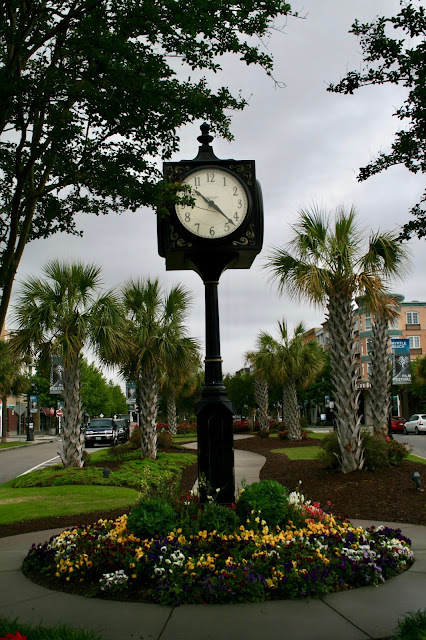 This beautiful clock was at the entrance to the retail area of The Market Common. On the other side was a large expanse of lawn with another water feature and the lake (sorry, no pictures of that). In this area the village holds public events like outdoor movies/concerts. On the day we were there, people were practicing for a Viking Ship boat race that weekend. A kind man saw us oohing and ahhing over all the flowers and taking pictures. So he stopped to talk to us about The Market Commons and things to do in the area, and then he offered to take our picture. We appreciate the kindness of strangers so much when we travel. 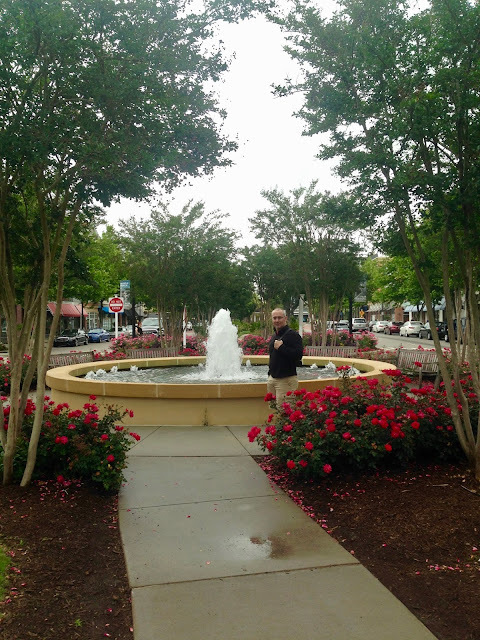 It seemed everywhere I went in South Carolina I smelled the beautiful aroma of Jasmine. This is a flowering vine that does very well in this climate. We cannot grow this in Wisconsin, so I was quite envious. Oh, the scent, it just permeated the air! I especially loved how they trained and trimmed this jasmine vine to form an arch. Have I convinced you yet to visit The Market Commons just to see the flower gardens even if you don't like to shop? Here is another view of that amazing jasmine archway. You can also see a close up of the residences above. 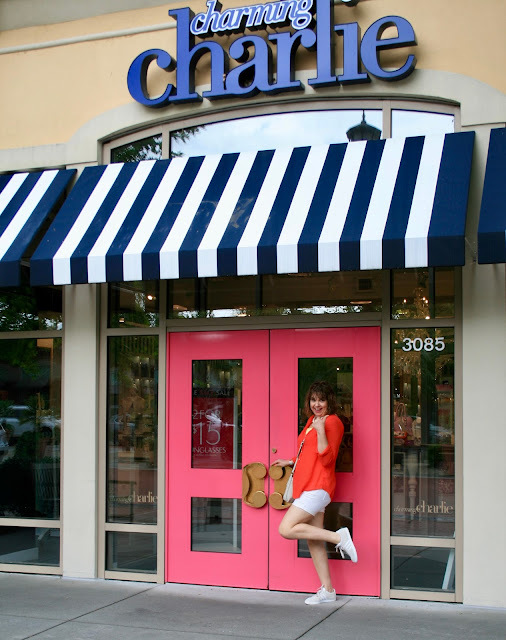 My husband and I were so excited to see a Charming Charlie (yes, he loves Charming Charlie's cause he loves to buy pretty trinkets for me....especially if they are inexpensive). We especially loved the design of this one. Aren't those pink doors pretty? 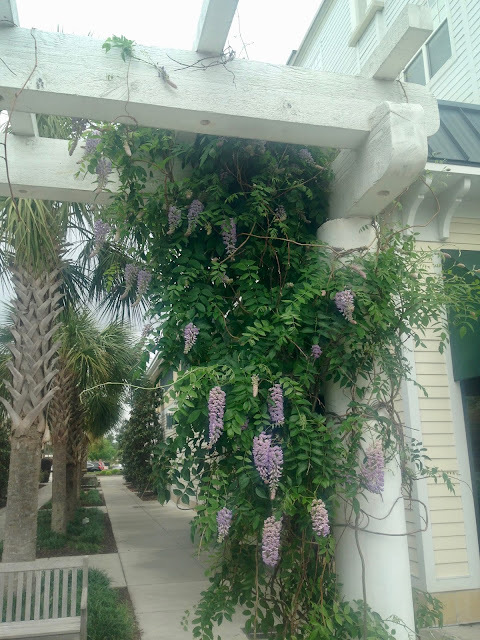 Another gorgeous flowering vine we saw a lot of while in South Caroline was Wisteria. 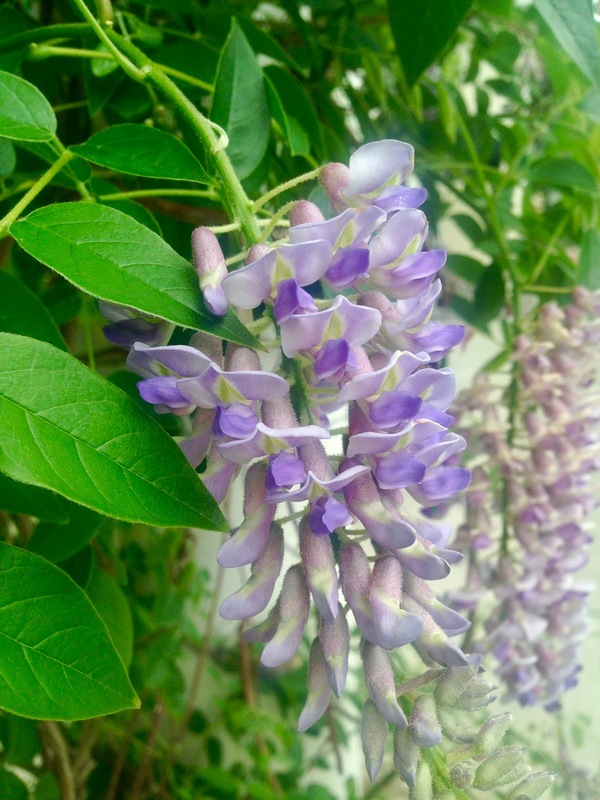 I think Wisteria is my favorite of all flowering vines. I just love their pendulous blooms and the scent is amazing! 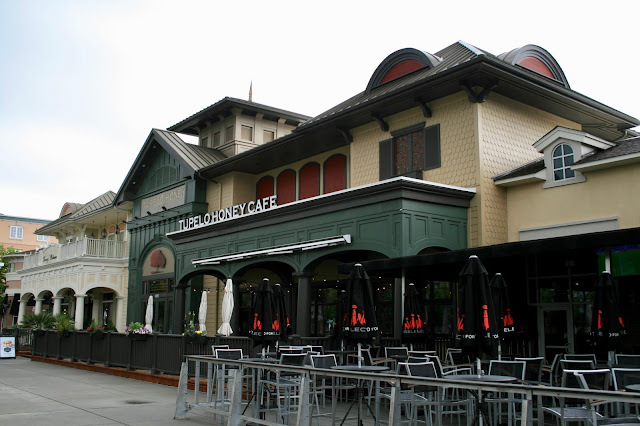 There are so many amazing restaurants in The Market Commons. This was one I was tempted by because I loved the decor and I was curious to taste some Southern food. But it was pretty pricey and we were worried about spending a lot of money on food we may not like because we're from a different region and have a different palette. So we stuck with what we knew and went to California Pizza and we were glad we did. I got a Mediterranean salad with hummus and pita bread and hubby got a pizza. It was soooo good we went back for dinner another day and got the same thing! 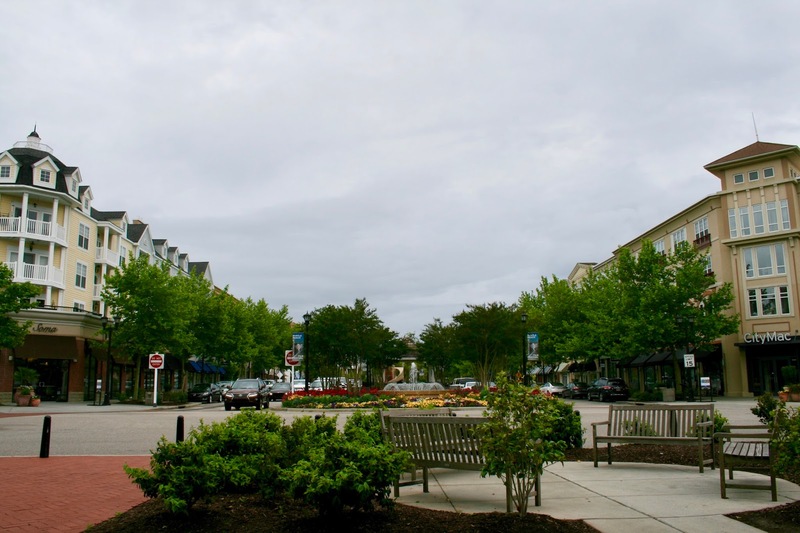 The Market Common was only a short drive from our hotel. After lunch, it rained again so we decided to see a movie. Apparently everyone else had the same idea for the movie theatre was packed for a Monday afternoon. We saw "The Case For Christ". I have to put a little plug in for this movie because it was so good! Even though I am a Christian I normally don't like Christian movies because they are either too cheesy, poorly made (bad acting), or not true to the bible. This movie however was none of those things and was the best Christian movie I ever saw. It's based on a true story of a Chicago Tribune reporter who was so upset that his wife became a Christian that he set out to prove the bible false. In the process he discovered that he couldn't prove Christianity false and he became a Christian himself. The acting in this movie is so good! And I loved the realistic relationship of the husband and wife. I never found it cheesy either, it was just so raw, real, and beautifully done. But be prepared and bring your tissues! It's a tear-jerker! Well I hope even if you are a not a shopper to visit The Market Commons. It's not that big and you could walk the streets of the village in a hour or two. It's the perfect place to go for dinner if you've been sight-seeing elsewhere during the day. I would love to see it at night too when it's all lit up. It's been years since we've been to Myrtle Beach. 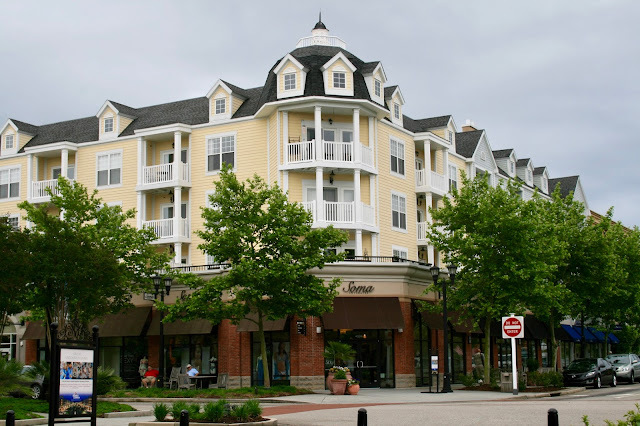 The apartments over the shops is a popular design for resort communities. Asheville North Carolina have adopted this real estate with their urban development and it really is a cool concept but I prefer living in a house. :) I'm taking a blog break but I did share this week's #WW linky if you're interested and if not then no worries, my friend. Have a good day! Really? I've never seen apartments over shops before unless it was in a historic downtown area. It's a great idea! It definitely must be a warm weather community concept. People wouldn't want to walk too far from their car to their home where I live. 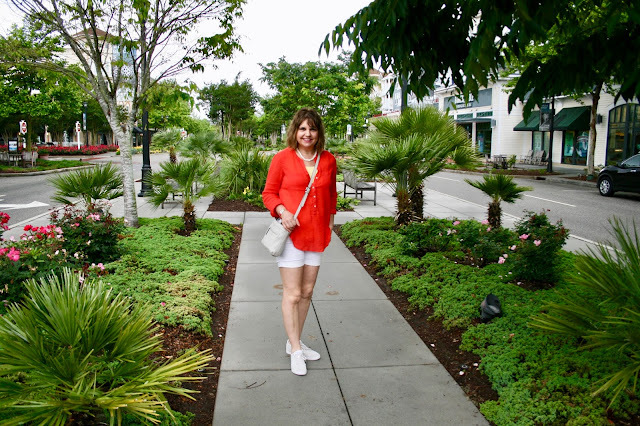 Have a great blog break...I linked up with you! I always hate it when it rains on vacation. Looks like you made the most of it! Love that red shade on you. Oh, I know rain and other bad weather on vacations can be depressing. But we always make the best of it. Yes, it's very pretty...a must see. Definitely go even if you only have a few hours. I am not a shopper but I would visit this area for the gardens. It looks like a relaxing way to spend an afternoon (or morning if it is a hot day). 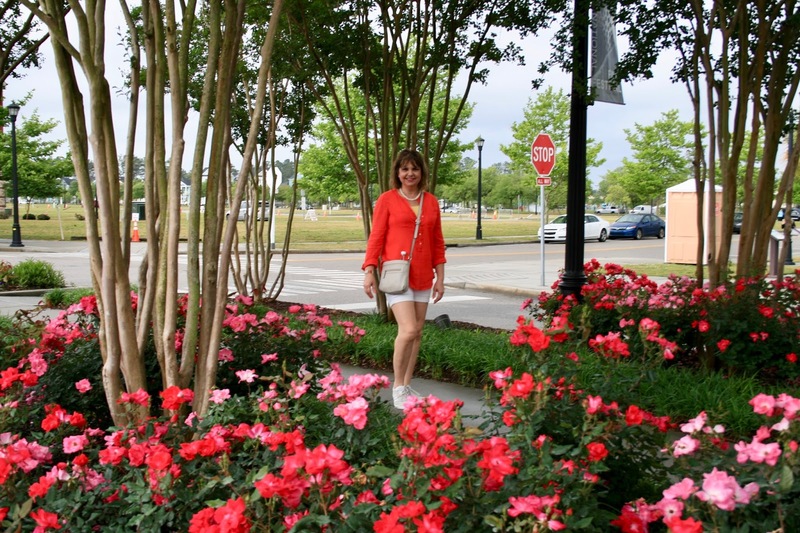 Yes, it's totally worth seeing just for the gardens alone! I would have had to stop in that Charming Charlie! The pink doors are cute and I love your pose in front of the store! 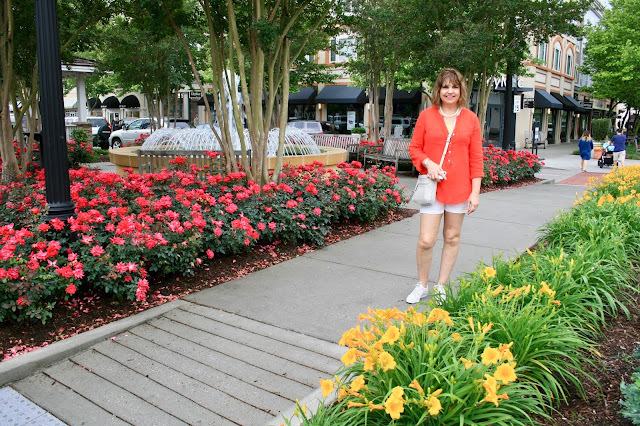 :) I love to see pretty gardens and it seems the outdoor shopping malls are so popular these days! Carrie we don't have Charming Charlie's where I live so I stop in to visit one every time I see one when I'm traveling. 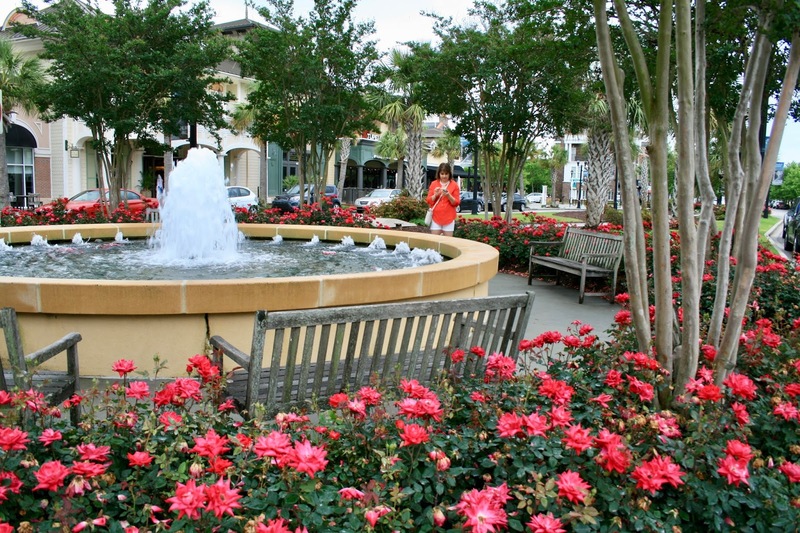 Outdoor shopping malls aren't popular in the north because it's too cold, so they are a treat to visit when we travel. I'm so jealous! Myrtle Beach is on my bucket list! Looks like y'all had a wonderful time! We had a fabulous time! Thanks for visiting Laura! 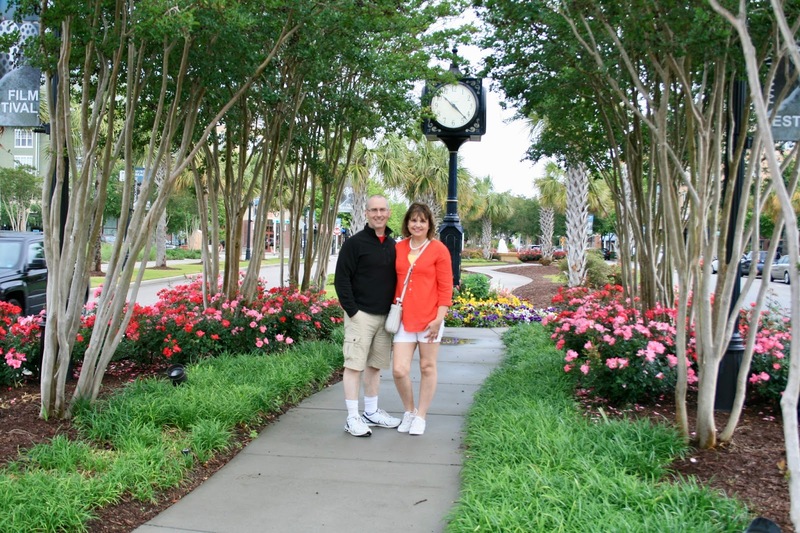 My in-laws live in Myrtle Beach! I love visiting because it's just so pretty and quaint. This looks like a fun shopping area! How fun for you! You'll have to stop here next time you're in town! 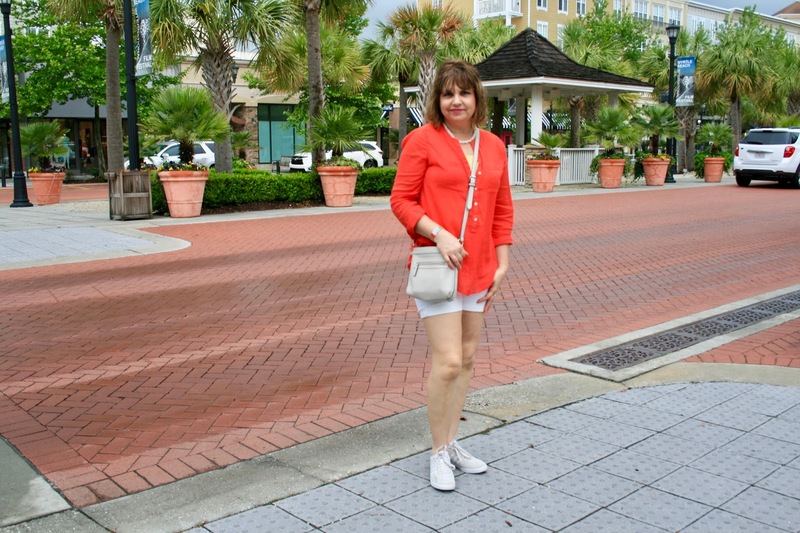 looks like a great trip and i love your orange top! The place looks so gorgeous.With all the greens and apartments and the cafes.I wish I could visit there once. Thanks Chris, it was so gorgeous! I'd love to live there! Such a lovely pictures!! I would like to be there!! Thank you! I would be very happy retiring here! 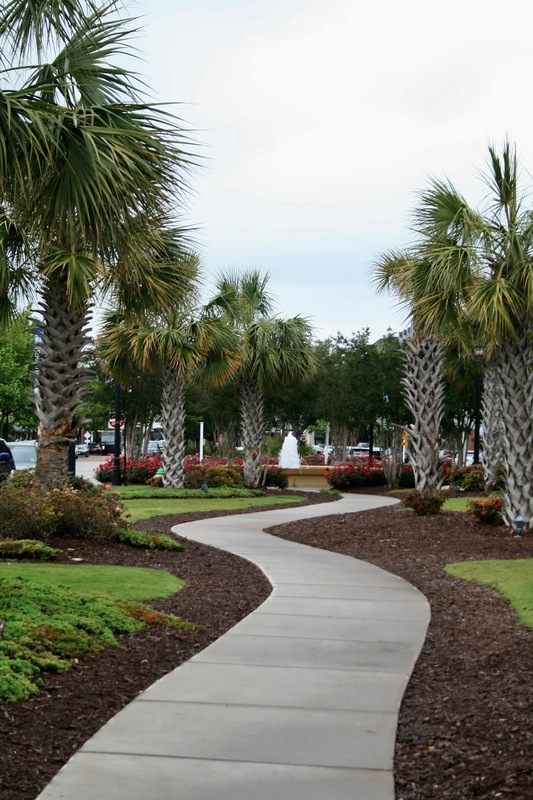 I've never been to Myrtle Beach but it looks really fun and beautiful! Glad you had a great vacation! Oh, what a lovely post. Have always wanted to go to Myrtle Beach. I appreciate how clean the market area looks, the well-kept gardens, the cobbled roads, the areas for sitting! I haven't ventured into my Charming Charlie's in some time. Thank you for the reminder. My PC, however, would just as soon we never went back there again. Ha!! Thanks Leslie! 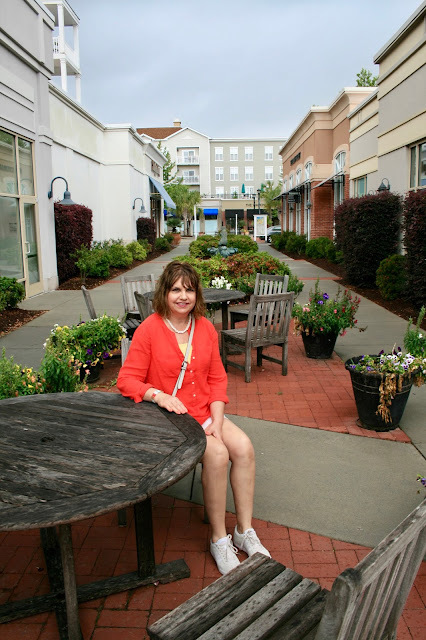 Yes, I appreciated the pristine atmosphere of the Market Commons as well.